The SINGER Heavy Duty 4452 sewing machine boasts an array of features that make creating elegant garments and gifts for yourself and others fun and exciting. With the SINGER Heavy Duty 4452 sewing machine you can get professional results in no time! The stainless steel bed-plate enables smooth fabric flow and the heavy-duty interior metal frame ensures skip-free sewing. 6 Basic Stitches, 7 Stretch Stitches, 18 Decorative Stitches, 1 Buttonhole—perfect for crafts, home decor, clothing construction and much more! Convenience Features Make Sewing a Breeze! •Threading the machine is so easy that you can have the entire machine threaded, from the spool to the needle’s eye, just in seconds. •Learn to use your machine with a teacher available at your fingertips! Simply check online for full tutorials. •SINGER Sewing Assistant App is available on the App Store and Google Play Store. •Buttonhole sewing is a simple 1-step process providing reliable results every time. Just place the button in the buttonhole foot and the machine sews a buttonhole perfectly sized for that button. •The bobbin loads from the top, so it is easy to insert. The clear cover makes it easy to monitor the bobbin thread supply. •The extra-large stainless steel bedplate allows for smooth fabric feeding of all types. 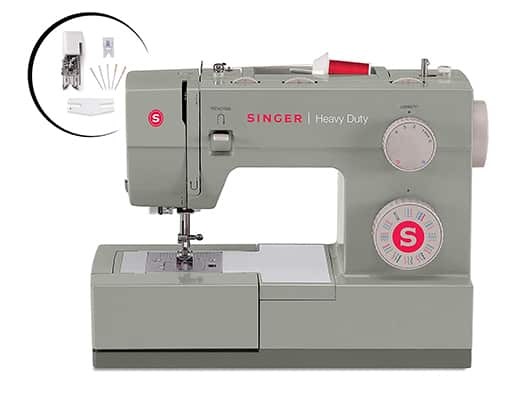 •The SINGER Heavy Duty 4452 sewing machine can sew fabrics such as denim, canvas and leather, as well as quilts and thicker fabric layers with ease. •The internal skeleton of the sewing machine is constructed of heavy duty metal. This rigid support holds all the mechanisms in perfect alignment for skip-free sewing and overall durability. •Simply switch the drop feed lever to disengage the feed dogs.Perfect for attaching buttons, darning socks and pants, and creative free-motion sewing. •Adjustable Stitch Length.and Width – Adjust the desired stitch length and width by a simple turn of the dial. •Three Needle Positions – Needle position can be changed for individual projects, such as inserting zippers or cording and topstitching. •Up to 6mm Stitch Width – Decorative and satin stitches can be set to 6mm wide—making a bolder and more pronounced look. •Free Arm – Provides professional results by offering easy access to cuffs, collars, pant hems, and other difficult-to-reach areas. •Extra-High Presser Foot Lifter – Offers more clearance for multiple layers of bulky fabric under the presser foot. •Reverse Lever – press the lever to reinforce stitches. •Drop Feed – easy to disengage for free-motion sewing, darning, and attaching buttonholes.